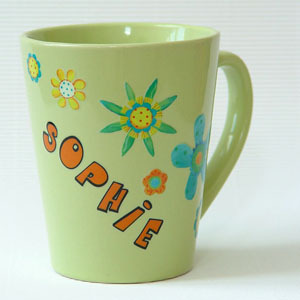 If you want to personalise a coffee mug, decorate a mirror, freshen up your tiles or simply feel creative without taking out scissors, glue and paint....go no further! These ceramic stickers are the latest addition to our crafty range. No firing necessary. Look here for detailed info and instructions. Click on any image below to see a larger view and for decorating samples! Please note: Prices do not include postage and handling. Please see terms and conditions.